You are currently browsing the tag archive for the ‘tree damage’ tag. This was the Council Meeting. Absent: Mayor Byrne & Clr Phillips. The following is how I understood the meeting & all mistakes are mine. The resident who wants the tree removed spoke: The issue of the tree is important to me because of the damage the tree has caused & will continue to cause & the risks to my family’s safety. I know it’s the largest tree in the street. The fact that I can’t shut my gate, I’m not happy about that. I contracted a report about the tree, which recommended removing & replacing. Council wants to retain the tree & monitor. This disregards my family’s safety. As a father, my family’s safety is most important. He presented a petition – from residents in the street who want the tree removed. People would have sent you letters. They would have got this information from Saving Our Trees. It was filled with false & misleading information, not based on professional information & should be disregarded. I wrote to her & challenged her to correct her readers & I have yet to hear back from her. Clr Hanna: Moved to remove the tree. The Doctor came 18 months ago & said they had been talking to Council since 2010. I went to the street & looked at the damage. I spoke to staff 2 months later in July  who told me the tree is to be removed in 2-3 weeks. He [staff] gave the period of 28th July 2010 to 21st August 2010. In August the resident visited me & said Council was not going to remove the tree. I am close to finding out who is responsible for not removing the tree. (Clr Hanna then mentioned a staff member’s name). How can we promise residents & then take it back? A pensioner was crying over his fence. The doctor here says he is not against a tree. This tree should be in a park, not in a street. Only last week we were talking about the safety for riders – what about the safety of residents? Clr Thanos: I support Clr Hanna. The test for me is whether the tree is causing damage. If it is, then it should be removed. It’s pretty rough when residents offer to pay to remove a tree or cry. I acknowledge that removing the tree will cost $24,000. One problem is that damage can’t be known for the future. A lot of trees have been planted too close to properties. People invest their whole lives in their properties. This is a very large impost on private residents to cover the costs. I know it often comes down to the insurer. Council has put the resident in significant financial disadvantage because of damage they have caused. Asking residents to take a chance on root barriers is a lot to ask. 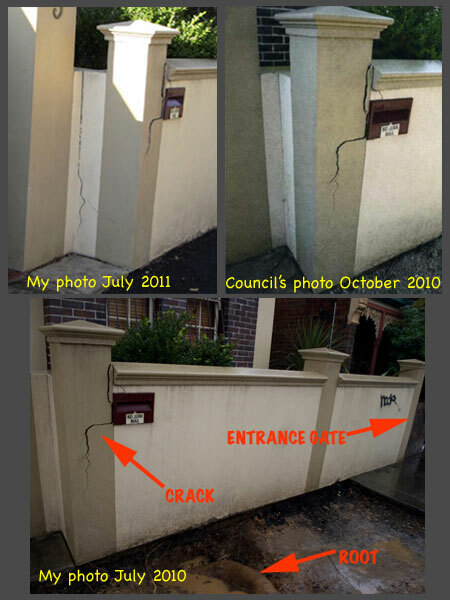 Clr Olive: Foreshadowed motion – that Council repairs the fence. Page 24 [of Councils’ report] says it’s not clear that the tree is causing the damage to the fence. I suspect someone has tarted up the house to sell to this resident. The garden is built up behind the fence. The photos show no problems to the building, the small crack in the step is normal shrinkage. Report says Council don’t think damage is caused by the tree. The fence is not leaning inwards, it is leaning outwards. Clr O’Sullivan: I personally inspected the tree & looked at the patterns of tree planting in the local streets. This tree is distinctive because there are hardly any trees & those there are are hodge-podge. It’s a Celtis, an ancient Mediterranean tree native to Spain & Turkey & thrives in a dry environment. The tree is very deep rooting. 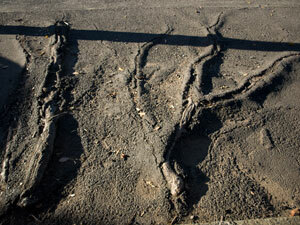 I looked at the consulting firm report – [says] long-term root growth may cause damage. While we may spend a small amount to retain it, but it may cost more in the long-term. My view is that it is correct to remove the tree. It is not a native. Amendment – Remove & replace with a tree with a quality canopy when mature. There was a distinctive tree on a corner near me that was removed before I was a Councillor, but it hasn’t been replaced. This tree, Celtis australis can live for 1,000 years. Clr Peters: Concerned with the removal of this tree. We paid $45,000 to remove a tree in Stanmore. Have a look at the house. The cracks are bigger now. I have to be pragmatic as the numbers seem to be against the tree. Add to the amendment that the opportunity be sought to plant trees in the street so we don’t plant in an ad hoc way & that these trees be planted at the same time. If you would be prepared to accept that, then I’ll agree to the tree being removed. Clr Macri: issue also for pedestrians. The concrete slab is dangerous. I support Clr Peters. 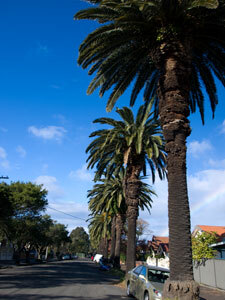 There is a number of planting opportunities in the street for trees. We could neaten up the street. Clr Hanna: In one email you will get that a lot of residents were not happy to be named. Whoever wrote this [that people want this tree retained] on the website [Saving Our Trees] will need to prove it. (I did not manage to take notes of the next bit of Clr Hanna’s closing speech, but I remember it as something like the following). SoT [Saving Our Trees] made this up. Where are the people that want the tree? 1 person came to my shop, but they didn’t want their name mentioned. I understood Clr Hanna to infer that SoT was the only source of information that people wanted this tree retained & SoT was therefore misleading the public. Carried unanimously. What this process demonstrated is that if the community are to be heard in their attempt to save a street tree, then the approach we take needs to be different. It’s been a good learning experience. My next post will be a guest editorial about the process of decision-making adopted regarding this tree. 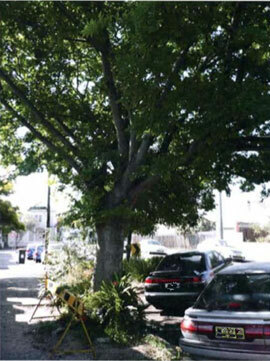 3 new street trees are up for removal by Marrickville Council, this time in Station Street Petersham. One tree is a Eucalyptus scoparia (Wallangarra White Gum) outside number 45. 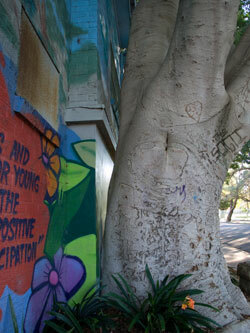 Marrickville Council’s notification says: Tree is dead. It will be replaced with Melaleuca linariifolia (Flaxleaf Paperbark), a native with perfumed, white flowers in early summer & creamy white papery bark. 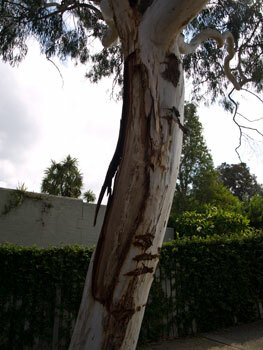 A second tree is a Eucalyptus sideroxlon (Ironbark) is outside number 67B Station Street Petersham. 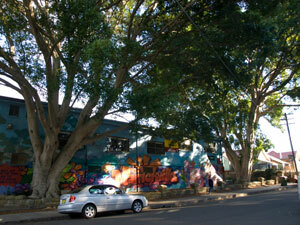 Marrickville Councils notification says: “Tree is in decline with significant amounts of dieback in the canopy. Exceeded its Safe Useful Life. Council intends to replace it with Gordonia axillaris (Fried Egg Plant). This tree has dappled, orange/brown bark & large white flowers (10cm or 4″ across) with prominent golden stamens. It flowers from autumn to spring & has glossy, dark green leaves with red tips in winter. There are no details for the tree outside number 59 Station Street because of an error with the pdf. I have notified Council about this. I will post about this tree once I have the details & post photos of the trees after I have visited them. The deadline for submissions is 12th April 2010. Last week I saw a street tree in dreadful condition on the corner of Station & Brighton Streets. I would bet it is one of the above. It had a large chunk of bark stripped from its trunk & had other deep gashes from repeated hits perhaps from close parking by a truck. In past weeks I have written about Richard Pennicuik & his tree sit-in to save a street tree outside his home in Thornlie Perth. Last week he came down after spending 110 days & nights in the street tree. At 2 am on March 29th 2010 Cameron Johnson & another man climbed the street tree outside Mr Pennicuik’s house vowing to remain & continue the protest to save this street tree. All 3 men dispute Gosnell Council’s assessment that the tree is dangerous. Personally, I don’t know understand how City of Gosnells Council can continue to say this tree is dangerous after it managed to remain undamaged & standing after last week’s extraordinarily ‘once in every 50 years’ severe storm, but perhaps it’s a matter of principle in their minds. The City of Gosnells Council’s insistence that the tree be chopped down says a lot about how much influence they allow the community who disagree with their ideas on how to manage the area. Surely Gosnells Council has other alternatives than simply chopping the tree down? Why can’t a couple of truly independent Arborists come & assess the tree? Perhaps they have but I have not seen reported news about this. At least with people sitting in the tree, it is less likely that someone will vandalize the tree to ensure it needs to be removed. Richard Pennicuik’s action has attracted a massive amount of threatening, aggressive comments from anonymous public on news web-sites. I fail to understand why one man’s commitment to a tree results in such hatred & vilification from people who don’t know him, the tree or the history of this tree. His action was non-violent & this itself is deserves applaud. It would have been a different story if he had sat in the tree armed with bazookas threatening to kill anyone who came near the tree. He didn’t. All he did was sit in the tree for 110 days & nights. The fact that others who came to visit behaved in a way that distressed the neighbourhood was not Mr Pennicuik’s fault.